What does China's growth slowdown mean to you? I ask here not about the New World Order, Global Power Shifts, or whether the US retains its position as global hegemony. Nor do I mean the impact on the world economy, a colossal actual thing, but still a relatively abstract concept. No, I mean, what does this slowdown in 2015 mean for you, looking to China as an export market; or you, in China, seeking employment as your labor market adjusts to its New Normal. 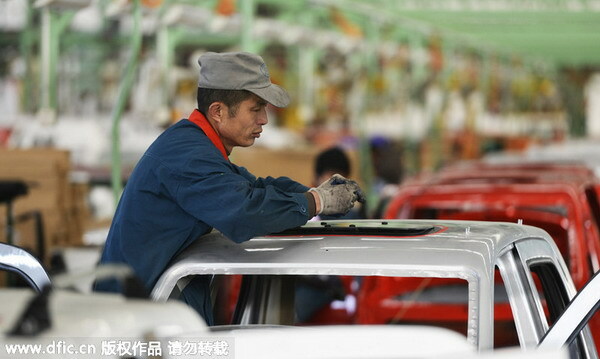 In 2014 China's GDP grew 7.4 percent, its slowest rate of increase since 1990. This seems an epic change from when that economy regularly turned in double-digit growth. The effect of this slowdown on those who sell to China and on those working in China must be extreme. But maybe not. Why? Let's do the arithmetic. Suppose the year is not 2015 but 2005, exactly a decade ago, and you're an exporter, somewhere in the rest of the world, predicting China will grow, say, 12 percent over the coming 12 months. 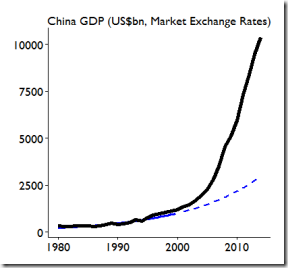 China's GDP then was $2.3 trillion at market exchange rates. You expect China's marketplace will increase by $274 billion (12 percent of $2.3tn). Whatever fraction of that market you sell to, that's what counts for your bottom line. Now, fast forward to 2015. China's growth might be as low as 7 percent these next 12 months. But, meantime China's economy has become a lot larger than it was in 2005. How much larger? The IMF's World Economic Outlook Oct 2014 forecast that for 2015 China's economy, at market exchange rates, will come in at $11.3 trillion. At this scale, growth of a mere 7 percent will increase the size of China's footprint in the global economy by $790 billion over the next 12 months. To put matters in perspective, this increase of $790 billion is 2.8 times the size of the increase of $274 billion 10 years ago. Thus, even at an expected growth rate a full five percentage points lower than that someone a decade ago might have optimistically forecast, China will generate economic growth in absolute magnitude almost three times larger than it did then. 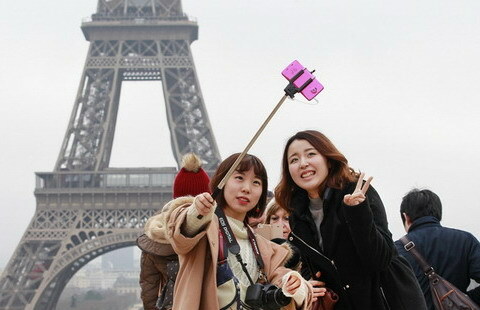 But, wait, the world today overall, not just China, has changed. A representative exporter will gauge prospects for selling to China based not just on China's scale, but also that of their own economy. Let's do the arithmetic on that. Should universities ban teacher-student relations? Should the well-educated have more children? Do we need a 'men's day'? During the visit of Britain’s Prince William earlier this month, President Xi Jinping said China would learn from the United Kingdom’s formula and use it as a template for China’s soccer reforms. Cultivating football at the grassroots level with qualified coaches training young players is the way to go for China, rather than concentrating on gold medalists. That way, future football stars can be nurtured through education. Even after three years in China, involved in education, I am still surprised about the Chinese obsession with tests and competitions.